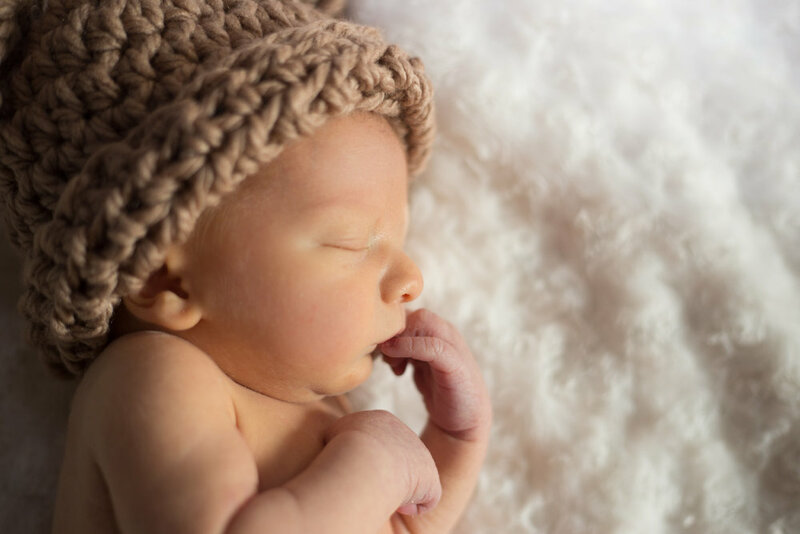 I recently had the pleasure of doing a lifestyle newborn photography session in Seven Fields, PA. I got to meet the parents during our maternity session last month at Preston Park in Butler, PA. This couple is so nice and easy to get a long with. I think it's fair to say we clicked. I just happened to bring along a Sock Monkey onesie as a prop to our maternity session and was happy to find out they had a love for Sock Monkey items and actually brought some Sock Monkey stuff with them. Jocelyn, the gorgeous momma-to-be, actually brought a Sock Monkey that she had when she was little. I let them have the Sock Monkey onesie at the end of the session and Brad was head over heels! I knew then I'd have to do something special for their newborn shoot. I then asked Stephanie Dripps from Dripps Knits (https://www.facebook.com/drippsknits -seriously check her out!) to make me a Sock Monkey newborn hat and of course she delivered! She's amazing. Anyways, I surprised Jocelyn & Brad with their keepsake at our lifestyle newborn session. "I belonged to Mommy when she was Little. Please love me just as much." I adore this crib and the whole nursery that Brad put together. Swoon! Love the pictures? Like my page!